If I was designing the SS15 collection for my own label, I would have taken a different approach and sourced the fabrics first. Buying the amount which I know would make up a certain number, then design from there. And because it's only in the last year that I have learnt Illustrator I tend to design around fabrics then sketch out a few ideas. 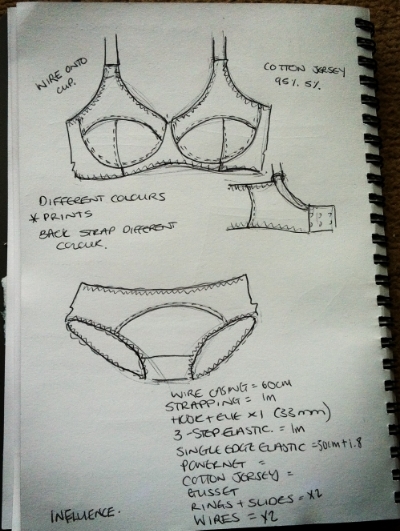 As I am designing one off pieces I have gone about it the other way, I roughly know from my sketches last time, the shapes I want to work with, and left it it quite open when it comes to fabrics. But as I am only making one off pieces to be sure I don't end up buying my body weight in fabrics and trims (something that often occurs when I enter a fabric shop), I have finalised my collection (in very rough drawings) and worked out a guide for my shopping list for the four samples that I intend to make-up. Hooks and Eyes (32mm) x 4, Wide strapping x 1m, Wide Elastic x 1m, No edge 3-step elastic x 2m, Stabiliser x 1/2m, Rings and slides x2 (gold) x2 (blk), Power-net (blk) x2, Mesh (blk) x 2m, Wire casing (blk) 2m, Strapping 3 1/2m, Wires x4, F/O elastic 3 1/2m, Single edge khola x 3m, Edge 3-step elastic x2 1/2m, Gusset lining (blk) x1/2m, Cotton jersey (95/5 or 97/3) x 1m over two colours, All over lace (blk) x 1m, Rose colour power-net x 1/2m, 3mm long tailed bows x 9. Next is the buying of the fabrics and drawing the images up in Illustrator.